I have spent a large part of my dog training career trying to squelch, or stop, dogs’ prey drive. Prey drive is the desire to give chase to things (other dogs, rabbits, scooters, cars, etc. ), and the majority of dogs have at least some. Often, it becomes a problem for owners whose dogs become aggressive, or reactive, when they are around these things. In the past, we have waited until the behavior was out of control and then tried to correct or stop it. It wasn’t until I got involved in protection sports like Schutzhund/IPO and PSA that I realized that I had been doing it wrong all of those years! Instead of avoiding our dog’s prey drive, we were encouraged to BUILD IT! And, while that sounds counterintuitive, it actually works because it puts YOU in control of that drive (and your dog’s impulsive behavior). 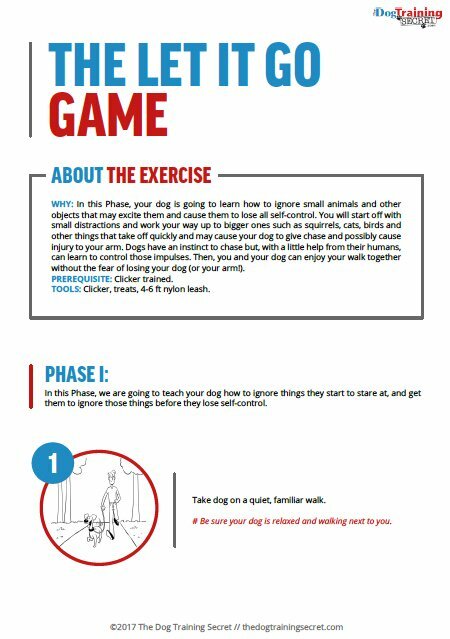 We have created a game to help you teach your dog to control the impulsive behavior of chasing animals (and other objects). It’s called “The Let It Go Game”. To download the next phase of this game, please click HERE. Some things, and some instincts, simply can’t be avoided. Herding dogs have a desire to herd. Scent hounds have a desire to sniff. Sight hounds have a desire to chase. Large dogs that were, unfortunately, bred to fight often have an intense prey drive. Ignoring these instincts is not going to make them go away! Trying to correct these instincts is also not going to work for all dogs. Certainly, there are dogs with very little prey drive, but there are also dogs with a lot of prey drive. Some of the best obedience I have ever seen comes from dogs with extreme prey drive! The owner, or handler (many of these dogs are police and military dogs), controls the dog’s prey drive by building it and harnessing it into a toy. 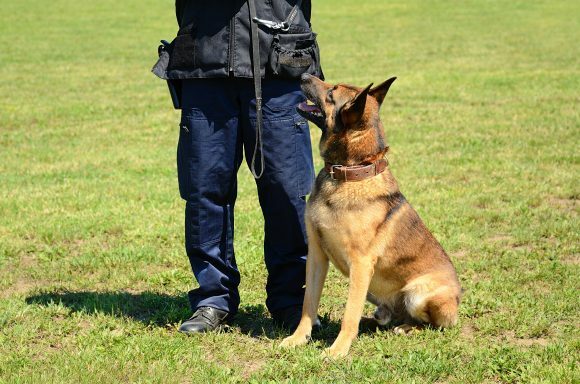 Have you ever seen a police dog that has complete focus on his handler? There used to be a ridiculous notion that drug and bomb detection dogs were addicted to the drug they were searching for, and that is why their drive was so intense when they were looking for their toy. I understand, to some degree, why people thought that, because the dog’s focus is so very intense, and it can be hard to understand that intensity. The dog’s prey drive is first built through play and teasing. Yes, I said it… teasing! Teasing is critical to building prey drive. Sometimes the anticipation of reward is better than the reward itself. I wrote an article several years ago about that. Let’s face it, things that require a little work and effort are often valued more than things that come to us easily. We tend to take for granted the easy things in our life. If you eat three meals a day and have snacks around your house all of the time, food isn’t a great motivator and is not as valued. Sure, you need food to survive but if you are lucky, you have access to it when you are hungry. If you don’t have access to food whenever you need or want it, it becomes more important and more of a motivator. If you have 40 tennis balls around the house, you probably aren’t going to be excited to go outside and play with a tennis ball. The toy, or the food, must be attained, and this builds excitement for the dog. Giving the dog things for free all of the time robs him of the excitement of working; it also ruins your training. If you control all of the good things, then you have the dog’s attention. Remember that police dog we talked about earlier? His handler has such great focus from him because he has been taught to love work (yes, any dog can be taught to love work), and his handler controls his toys and food. 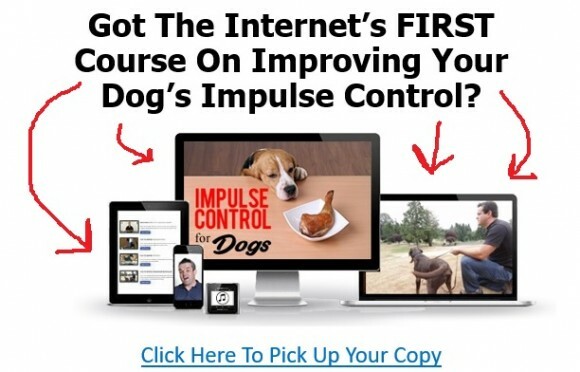 If you build your dog’s prey drive you can teach him to control it. Learning to proactively control the problem (by helping your dog control his impulses), and use it to your advantage, is great dog training!